I have throughout this essay used many citations from Eugenides’s novel both to expand upon the filmic text and to illustrate points of departure. As a means of concluding, I would like to briefly cite several sequences which the boys could not have possibly witnessed and refer once again to the novel to demonstrate how these seeming breaks from the boys’ perspective prove rather than contradict my assertion that the film (and particularly the image track) is to be understood as an invocation of their collective memory, and then finally concede several possible exceptions which could arguably be considered indexical. Shostak argues that the film deviates strongly from Eugenides’s novel in that it “resists full appropriation of the boys’ perspective,” citing the depiction of events for which the boys were not present, and a lack of reverse shots “establishing the boys’ presence” at events which they could have theoretically witnessed but are not, to her mind, confirmed as having done so (Shostak 182, 193). She does, however, concede that events witnessed by Trip but not by the boys who comprise the first person plural narrator do not necessarily break this perspective, since Trip can “be co-opted to the narrators’ objectifying perspective rather than removing the viewer from it by our awareness of the camera’s objectification of him” (189). While I agree that second hand sources can be woven into the fabric of the narrator’s perspective, I believe that Shostak is too literal in her definition of perspective, allowing only for what the boys can see and not what they can envision. Hovland, for instance, identifies in the film’s appropriation of heterogenous forms an “overt style” meant “to demonstrate the boys’ perspective,” which she acknowledges is not limited to indexical or empirical contact, but includes “visual manifestations of the boys’ daydreams and imaginations” (Hovland 262). This, to me, gets closer to the heart of Coppola’s style and intent, which often uses optical effects to visually convey knowledge that the narrator possesses but has not seen. An example of this is the iris effect on Lux’s dress, which creates the illusion of an X-ray displaying the “Trip” which she has written on her underwear with Sharpie. Many sequences in the film could not have been witnessed by the boys. The two most prominent are Mr. and Mrs. Lisbon’s visits with the psychologist Dr. Hornicker (Danny De Vito) and their priest Father Moody (Scott Glenn). The novel, however, informs the reader that the boys are in possession of Dr. Hornicker’s several case reports on Cecilia, and Father Moody, in addition to having been interviewed by the boys at some point following the suicides (“When we asked Father Moody about this…”) is said to have been overheard by “Paolo Conelli, an altar boy,” telling the church choirmaster about his visit with the Lisbons (Eugenides 37, 50). Thus these sequences can be thought of as constructed from the narratives read by and told to the boys; despite their lack of an “overt style”, scenes such as those with Dr. Hornicker and Father Moody can be considered as a visual ekphrasis of textual or oral data not unlike the superimpositions previously discussed. 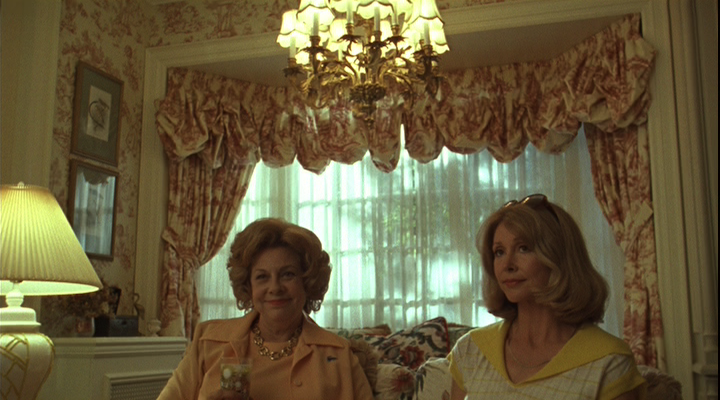 Coppola incorporates several sequences of neighbors and classmates candidly discussing the Lisbons. Many are shot with the boys in frame, huddled around their subject; others share the visual aesthetic of a television interview, with the subject isolated in the frame, looking just off to the side of the camera. 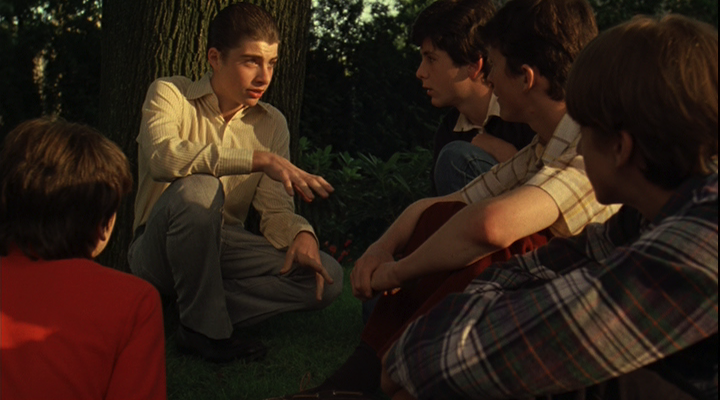 When she employs this latter form, Coppola offers no reverse shot to confirm it is the boys to whom they are speaking; that she elides such visual confirmation in these sequences should refute Shostak’s argument that the lack of reverse shots elsewhere in the film negate the possibility of those sequences having been witnessed by the narrator. That the interviewees speak not directly into the camera but just off to the side of it implies a multiplicity of interviewers, as though all four boys were seated in a line on the couch and we are seeing the perspective not of the one positing the questions, but perhaps one seated further down who listens and watches. The voiceover is largely absent during the scenes between Trip and Lux, suggesting that the narrator is simply relaying Trip’s account of the events to the audience with a minimum of editorial moderation. Trip is one of the many characters who are depicted giving depositions to the boys, but Trip’s interview scenes are significant in that they take place significantly later than the events being narrated. Both the novel and the film, in keeping with their elusive temporalities, refrain from dating the events precisely. 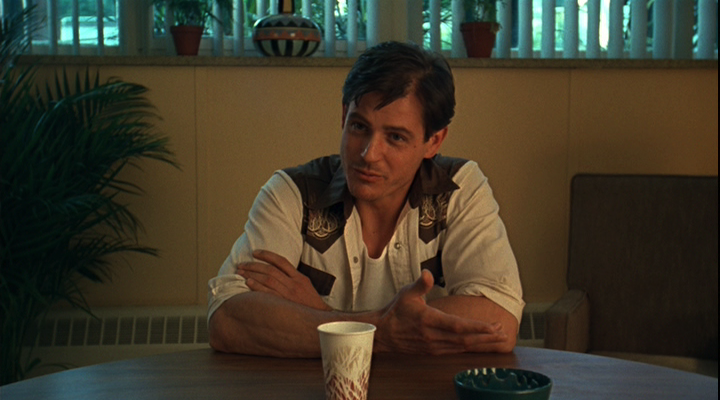 A title card early in the film simply tells us that the events took place “25 years ago.” In his interview, however, Trip is in middle age, speaking from a detoxification facility following a life of drug and alcohol abuse. These sequences are the closest the film comes to visually depicting the present day from which it is narrated. Since the voiceover neither acknowledges these scenes or speaks over them, an argument could be made that they are indexical, occupying the same temporality as the voiceover narration; they are at the very least among the few purely singulative events depicted in the diegesis. The local newscasts which are frequently shown throughout the film may be interpreted as indexical, but they are presented as iterative rather than singulative. Their visual representation, appearing on the tubes of television sets in neighborhood living rooms rather than autonomously without a visual context, also suggests that they too may be invocations of the narrator’s recollection of the newscasts rather than the newscasts themselves. There are additionally only two shots, totaling only six seconds, in the diary sequence which I believe are both singulative and indexical. 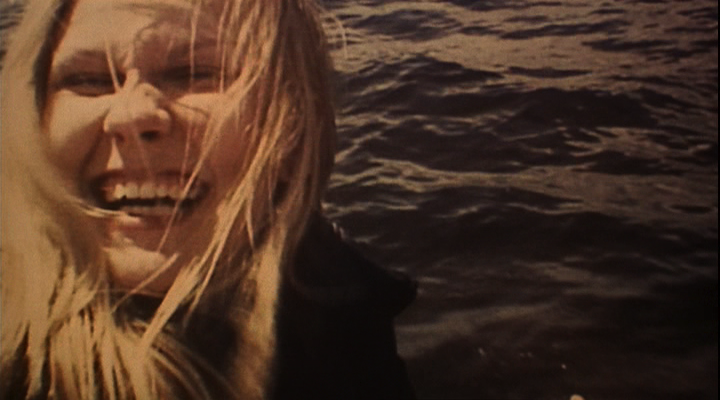 As Chase reads from Cecilia’s diary, “Today we went out on the boat… Lux leaned over and stroked a whale,” the image track cuts to overexposed Super 8mm footage of Lux performing the act described in the diary. There is a brief cut back to Chase reading from the diary with Tim Weiner craning over his shoulder, and then another shot of Lux on the boat, smiling for the camera. The surface noise of the image, like that of the vinyl records on the film’s soundtrack, signifies the strip of 8mm film as a physical artifact, presumably found among the family photographs and other “souvenirs” the boys picked from the trash after the Lisbons liquidated the contents of their home following the suicides. Cecilia’s remark that she “didn’t think [the whales] would stink so much,” implies that this was the girls’ first time encountering whales on the boat; her premature death, meanwhile, suggests that her “hope that we can go again sometime” went unfulfilled, marking this bucolic day on the water as a singulative event. Elision, ambiguity, impressionism, subjectivity, unreliability; these are all traits of memory as much as they are traits of The Virgin Suicides. Jeffrey Eugenides’s novel was about many things; Sofia Coppola’s film may not translate them all to the screen, but by focusing on nostalgia as a signifier of loss and amplifying this element of the narrative, she, along with her cast and crew, have demonstrated the ways in which the anomalous use of heterogenous cinematic forms can poetically suggest memory and its multiple registers of temporality, signification, and indexicality. In doing so, she has created a singular work which is microcosmic in its focus and macrocosmic in its scope; it purports to unfold over the course of thirteen months, but signifies an expansive story-time which stretches indeterminately backward into the past through its historical allusions and forward into the future by suggesting both the ongoingness and the futility of the narrator’s project. Though later films, particularly the Oscar-nominated Lost in Translation and her anachronistic portrait Marie Antoinette, are held further aloft in the public opinion, it is The Virgin Suicides which remains Coppola’s most interesting, evocative, and stylistically rich film to date.